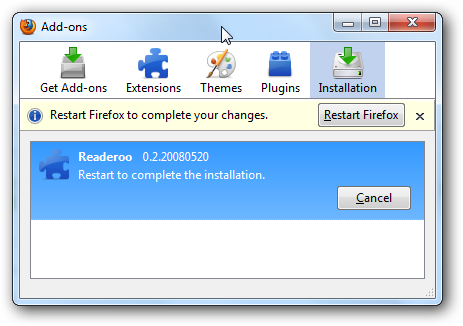 If you’ve already upgraded to Firefox 3.6, you might have noticed that many of your extensions no longer work, and the old checkCompatibility trick doesn’t work anymore. Or does it? Thanks to my good buddy Daniel for pointing out the change in Firefox 3.6. 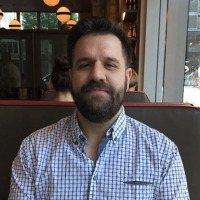 His personal blog is so nerdy it will make your head explode. This is the error you get when you try and install an extension that isn’t compatible. Pay special attention to the Firefox version string, as we’ll need that later. 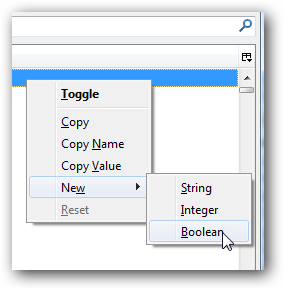 Type about:config into the address bar, and then after clicking through the warning, you’ll want to right-click in the list and choose New –> Boolean from the menu. Now we’ll be prompted to enter the preference name. This is where you need to pay attention to the exact version you are using, because the preference has to be set for the exact version of Firefox you are using. We’re using Firefox 3.6b3, as noted in the error message above, so the preference would be the following… note the capital C there, very important. Basically the format is extensions.checkCompatibility.VERSION.b for Beta releases or extensions.checkCompatibility.VERSION.a for Alpha releases. 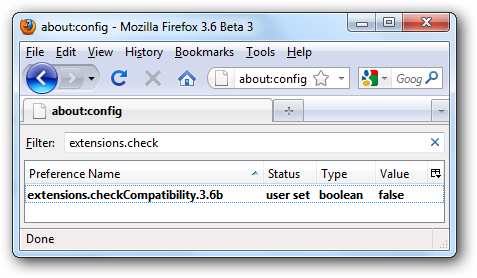 So if you were testing out Firefox 3.8 Alpha, you’d use extensions.checkCompatibility.3.8a as the preference name. Yeah, that wasn’t the simplest thing. 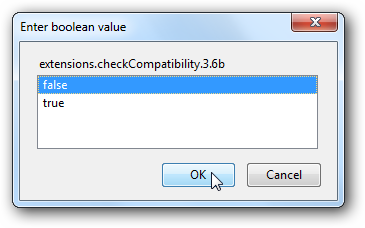 On the next dialog, just choose “false” and close the dialog. You should now see the value in the list if you filter for it. And your extensions should now install. If they don’t, then you probably put the wrong version into the preference name. Definitely a very useful tip, and one that I suspect I’ll be using all the time.